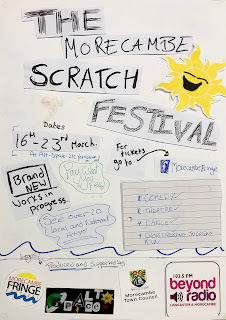 Side one of a locally-distributed Scratch Fest flyer. 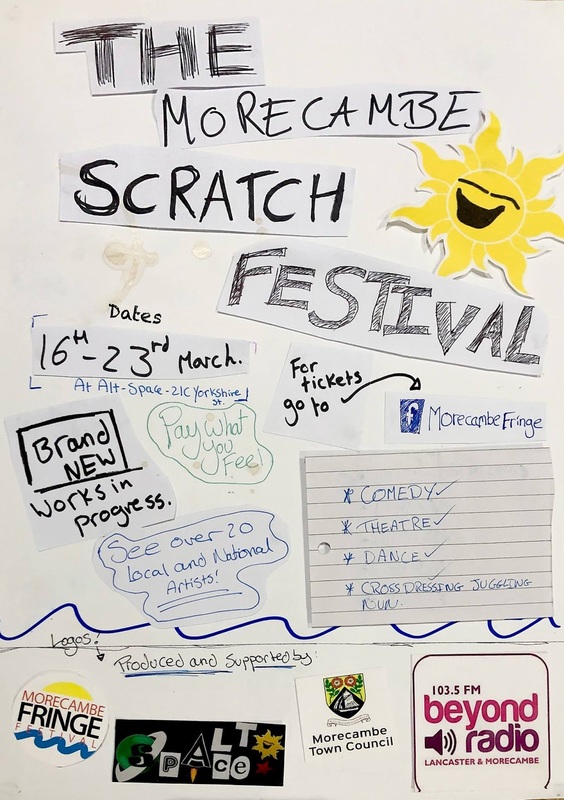 There's some pretty cool stuff going on in Morecambe at the mo, at Alt-Space’s 'Scratch-Fest', a festival aiming to air acts and give them feedback before the upcoming Edinburgh Fringe. It's always hard to talk about this kind of thing, because the diversity of a festival of this nature is hard to encapsulate neatly, but hey, here goes. The first thing I saw - and one of the stand-outs so far - was a stylophone-based musicomedy performance, with self-deprecation and 'off the wall' jumps from image to pun. It’s one the best acts I've seen since Stuart Lee, and you should check out 'Stylophobia With Dan Rubinstein' on Facebook for his upcoming gigs. I found a lot of it was funny because it wasn't all that funny - "corny" is a word Dan used himself, which is a very apt one for me - and the intentional lack of slickness is part of not just the charm, but also the element of surprise, that, for me, made his jokes burn brighter. On another night, though, we've had a journey through Richard Pulsford's research into his family's military history in 'Conflict of Interest'. I thought, because he was introduced as a comedian, that the presentation he was giving was going to be an elaborate ruse for a whole heap of humour. In the end, it was a 'straight' account of said history and, whereas not my 'usual cup of tea', it was still a pleasure to be able to attend, to see someone's work made reality, and to learn. I've talked before about the privilege it is to be able to go to poetry readings - and this festival is very similar. It’s not just being in an environment where works are more ‘in progress’ than you might see in, say, a big arena, but also to get to talk to the artists afterwards is great. I had a good few words with Richard after his show about the process of him putting his presentation together, and he was very generous in chatting to me - especially as I’m just this randomer with a can of lager and healthy disrespect for personal boundaries. To have time with them away from the stage (i.e. in the pub) is always fascinating, too. I often consider it my duty to buy these heroes of the stage a drink (a personal thank you for their efforts), and often we have a chat about their act. In Dan's case, we spoke comedic aesthetics, and the possibilities of punnery, as well as how lucky we felt to have him, and how lucky he felt to have such a space (outside his usual London) to take his work. In Kev's case, we spoke a bit about his career (punctuated by more 'tricks' of his). I've also been lucky to spend quite a bit of time with Walter DeForest, creator and embodier of the fantastic and internationally-renowned 'Van Gogh Find Yourself'. Whereas last time I spoke to him more about his act, this time it was thrilling to just ramble about any old anecdotes, share in cheeky puerile humour, and some of the Sportz Banter (TM). Other members of our fair Morecumbrian society were talking about CBD-soaked (literally) times, and, although the oils weren't flowing in reality, the intoxication was caused by these crazy, switched-on, rule-makers and -breakers, the inspirers and questioners of our time and place. It's a massive boon that there are suddenly places now in my home town that cater for us misfits, thanks to Matt Panesh and his team. It's just wonderful to be mixed with all these idea-mongers and talent-spinners, talking across genres and experience levels. Side two, detailing the acts. I've always been a big film fan. I think as a kid, I found comfort in the rise and fall of a classic fairytale-esque storyline and, of course, good triumphing over evil (such good preparation for later life...). Later I enjoyed watching writers and directors push the boundaries of all the action you could fit on a screen, my teenage years filled with films that were about exploring coolness via largely large males wreaking havoc on various villains, seemingly invincible, yet just human enough. Since then I have, as with all medias, tried to expand what I watch, learn about what effects are used (and how), become critical of the mainstream and generally seek to find things that offer fresh perspectives on art and life. Mark Kermode is a bit of a hero of mine. For a long time I wanted to be a film critic, and he is just one of those people that I'd like to be like: knowledgeable, erudite and cool to boot. Now I (we, us!) can watch five hours of him on our screens, doing what he does best: entertaining and educating us, in his groovy way. I've watched three episodes so far, the Heist one (probably the genre I'm most familiar with on the list), the RomCom one (I'd never been a big fan of the idea of RomComs, especially as the ones I've seen (Along Came Polly, or Hitch type saccharine shtick) have done nothing to inspire me, but Kermode explains examples I'd never thought or heard of in a way that changes my conception of what they are and what they can do, which makes me want to watch more) and, just now, the Coming of Age one (which is quite moving, actually. It explored the idea of the filmmakers' personality and experience coming out in the finished product and, indeed, explained the gravity of the task of trying to capture a universal human moment, such as when adulthood invades and subsumes child-like innocence for good). The reason why I didn't want to comment after watching every episode was because I'd end up with five separate rambles (I struggled to write as little as I did in this paragraph, and it's hardly 'streamlined'), and writing this half-way through at least helps me comment on why I think you should watch the series. It's such a joy to learn from experts. What you get per episode is someone who looks at archetypes and exceptions to give you a picture of the overall genre - structured with a few sub-sections, such as character, location, music etc. What is so amazing to me is the period of time that an episode spans. Because Kermode's knowledge base is so broad, we are taken on a trip potentially from the first movie of its kind (so potentially even pre-1920, before the first 'talkie'), to this year's releases. We are shown instances of homage in the intersticial period (and you may be surprised how many homages there are in a single genre, the Wallace and Gromit: The Wrong Trousers/Mission Impossible one being salient), but also points to where writers and filmmakers grow tired of the self-referentiality, the cliché, and break out to do something unexpected. Another part of why the series as a whole is worth a look, is that it examines (if only in passing) outside the films, the current Hollywood (and beyond) 'scene', addressing sexism and inequalities etc, hoping for things to be addressed further and bettered. I suppose it's this - looking at what's being done wrong and right in the industry, to how exactly humanity and other existential dilemmas are configured through filmic arts directly - that makes me feel privileged to watch it. I'm learning about life and philosophy, about the possibilities of our mind. It really feels that deep to me, while not coming across as heavy or lecturey at all. Even though I consider myself (at least temporarily) 'offline' as a writer now, I find this series inspiring, and I hope you do too. A huge thank to Sam Riviere for bearing with me thru the process, and to the folks who ran The Other Room, where the early version first appeared. First thing I want to get into is the [Peter Barlow's Cigarette] reading. As I said in my post announcing my participation, I wasn't feeling myself beforehand, thanks to one of the deeper and more prolonged periods of depression I've had. I was consistently anxious, thought I had nothing to offer and that I was generally going to be a failure, outed as 'not really a writer' and all the other destructive thoughts you get at times. Actually, the reading turned out to be very positive. I didn't read well - I mean, it was beyond doubt in my own mind that I wasn't projecting well, and interrupted my own rhythm at a couple of points, but it was pointed out constructively by someone else as well, so not just my own opinion - yet there was good feedback on the poetry itself, which is more important to me to be honest. There were other supportive comments about my reading, and a nice chat about the act of reading in general (even people I see as far-ahead stars still suffer nerves and crises of confidence. We know this, and yet we forget it sometimes, especially when we compare ourselves to others). I read first, which was a big help (especially because that's how I'd visualised it happening), so then I could sit back down as soon as possible and enjoy the other readers, who were great (still can't believe I had my name anywhere near theirs on the same bill... I know that's no measure of me, or my work, but it still feels amazing). At first, I tried not to buy everybody's books (just because of the finances), but everyone moved me to the extent that I felt I had to have their works to peruse fully, which shows their high quality. I'm really excited to get stuck into Linda Kemp's Lease Prise Redux, after having read extracts and, of course, enjoyed her performance. I think it's really important work, very sharp. 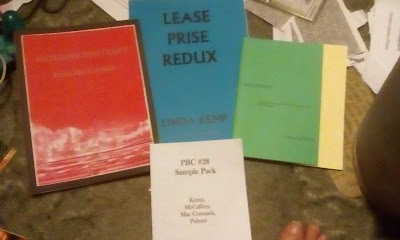 Also to be enjoyed are Steve McCaffery's Certain Words, and Karen Mac Cormack's Rechelesse Pratticque, the readings from which I liked, too. Steve's felt more like a prose-collage poem, large and arresting in its being, but in Karen's I got the sense of smaller, more discrete pieces, with surprising twists in her delivery from one to another. Afterwards, though, I felt a big change. Part of my worry leading up to the event was that some of my work didn't feel 'experimental enough' (to put it politely), and some of my more directly political pieces, I thought, were tending to less-substantial 'preach poetry' (and even though I've been told that I needn't worry about this, it's hard not to...). There's a time and place for that kind of work, and many people working wonders in [politically-based] performance poetry. I thought that I may have moved into that area because of what I'd recently read, but, thinking about it some more, saw through to what I think is perhaps a more core reason. I'm more and more 'down' about the world situation (more fearful, more angry, more ashamed, more disheartened...). I think that maybe some of these more 'performancey' pieces came out at this time because I want to address this, but even my best attempts feel shockingly ineffectual. 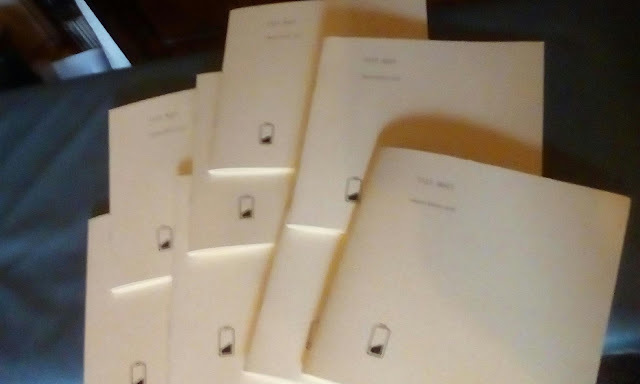 Though I don't feel that all poetry is 'political' (or, rather, the main focus can be something else), and that in theory I should be able to 'just write about something else', I feel despondent and want to move on. To be clear, even though the reading ended as a genuinely positive experience, the pervasive negativity in the world that I feel steeped in makes me want to stop writing poetry (for the time being at least). I was thinking about starting back up with an old novel of mine (started it last year, reached 39,512 words [including title], then started a job that hindered creativity for me) which, ostensibly, is a bit of silliness, but it was a good challenge, and a welcome distraction from what was going on at the time. I still want to read poetry, and I know that I'll still think 'poetic thoughts' - might even still put some of it down in words (or whatever else) - but, at the very least, my focus is moving on [to sorting out my life, hopefully]. In some ways, I'm only saying that I'm not going to 'try and force it' - which isn't really a readily recommended technique anyway - but I feel it's a tadge more nuanced than that. I arrived late, so missed some of Ruth Cockburn's routine, but it was obvious in the half-hour I saw that she is a special talent. It's hard to come up with a single good song and put that into a routine seamlessly, but she sang many original numbers, and managed to weave them into spots of 'pure' observational stand-up, as well as other multimedia elements (including recorded interview material, which was quite touching, as well as amusing), which all combined to make a thoughtful and refreshing take on love and sense of place. After a short break, we were supposed to enjoy Brennan Reece, but, filling in for the aforementioned double-bookee, was festival organiser and all-round nice guy Matt Panesh. I've never heard Matt perform before, so I was actually considering myself lucky in the situation. He mostly read out from a book of his poetry (if I find out what book that was, and where I - indeed, 'we' - can get our hands on a copy, I'll let you know), and the mix of humourous, political and social observations within his work fitted in well with the evening's entertainment. He's lived quite a life, and I really was rapt as he relayed tales of times on tour, or while working (indeed, being fired from work). Although not what I'd consider as an out-and-out comedy show, there were some unintentionally (no, they were intentional, but they were unplanned) hilarious moments, courtesy of a couple of arseholed pub punters who decided to spraff loudly about lord-knows-what and chip in with random corrections/affirmations, all of which were ad hocly batted back by Matt (charitably so, I might add), which pleased the audience no end. Another break. Another pint. Another comedian - none other than Tom Little. The first thing that struck me about him was his fantastic energy. It's really high-frequency, but he's so warm and charming, that you never feel attacked by his performance. In fact, there were many moments of audience participation that genuinely felt cherished by both audience and orator. I liked Tom intensely, and I really don't want to be over-wordy about why. He was self-deprecatory, a bit meta, decently cheesy, great at being funny off-script and hard-working in his writing (and memory! The things he's researched and memorised, you know, they're more than just trite set-pieces in an overall comedic game) - that's why I loved it. All those ingredients show a natural, yet industrious, talent, and I hope he gets to wherever he wants to be. I certainly prefer him to all of those terribly middle-class comedian clones... I was going to name names, but I just had a premonition of that coming back to haunt me, so I won't. Anyways, I'll let you get back to whatever it is you were doing before clicking on this link. I know I didn't go into a lot of detail back there, but I don't want to spoil anyone's Fringe by revealing jokes ahead of time. In that sense, I feel honoured to be able to not just look through the window into a creative process, but be inside the house as it's happening and, if laughter be the comedic writer's barometer, maybe even be part of that process in some small way. In that sense, it is much like going to a poetry reading - an honour (not necessarily a solemn one), and I thank the performers, organisers and everything that led to the moment, for a great time. 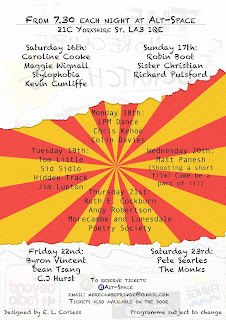 Hope to see you at more of the week's events (click on the link up top for all the news and performers). Peace, love and light.